Want something fun to do with your friends and family this weekend? Do you love funnel cakes? Well if you answered yes to any of these questions then the El Paso County Fair is the place for you located just thirty minutes to the east of Colorado Springs in Calhan, the fair is running July 15-22, 2017 from 10:00 a.m but most events don't start till 11:00 a.m. And the fair closes at 10:00 p.m, but if an evening event is still running, the grounds will stay open until the event is over. The fair has a lot of awesome family fun events to catch from the NSPA Truck and Tractor Pull, The Ranch Rodeo, The CPRA Rodeo, performances from Jake Worthington, and Sandy Wells. The are also holding Auto Racing and a Demolition Derby! And of course Funnel cakes! Vendors of all types and for the adults there will be beer at the fair as well as petting zoo and carnival! And again all this happens just east of Colorado Springs in Calhan. 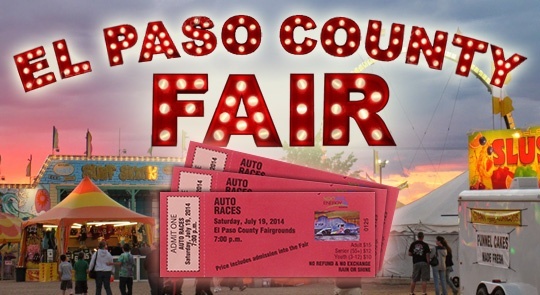 So be sure to go out and see all the the El Paso County Fair with admission prices only running for $7 for Adults, $5 Seniors, Kids 3 yrs to 12 yrs are $3 and Kids 3 and under are FREE!